Never fear Ladies 'N Germs; Hya! The Show's almost over, as we're finally on the home stretch of this Mondo' Car Show review, as I race back to Nofendersville to put another log on the fire 'N dream alongside my uncle; Oh Never Mind! Prior to initially viewing the AWESOME AMX, we'd run across a 1967 Corvette for which I'd not paid close Attenzione to, and originally scribbled down in my notes that its interior was Elkhart Blue? To which after scouring Al Gore's wondrous invention, thee A-L-L knowing Internetz; Hya! Have discovered instead, that Elkhart Blue was one of three body colours offered that year, while the car sported a blue interior and reputedly was the very last 'Vette produced in February, 1967. Passing by the center of the show's boundaries, where a DJ was casually calling out raffle ticket winners, of which I recall one being for A-L-L of UZE GARDENERS! A pair of solar powered lighted Mickey & Minney Mouse Statuettes; EUREKA! Then back to the music, as that timeless classic, the Beach Boys 'lil 409 began wailing! With other Hits such as Rhonda and I Get Around wafting thru the crowd as we made our way further down the street. 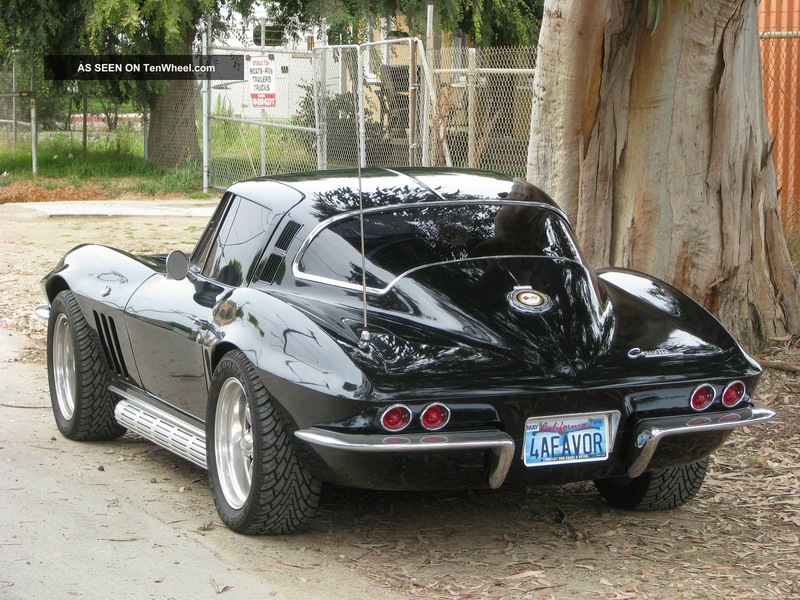 Approaching a red '65 'Vette, I asked Mary Ellen: Is that a Corvette, which are the ENEMY! Oh, why is that? Cause Corvette's raced against the Cobra and Mustang, and Chevy's are the ENEMY! To which unexpectedly she told its very nice owner, Tomaso doesn't like Corvette's because they're the ENEMY and he's an ex-Ford Mustang guy; SWELL! Thanks A lot Mary Ellen! To which his answer totally perplexed me. Telling us 'Vette's are great to look at but I'm told Mustang's handle better; would you agree? The very friendly man, who'd later tell us he was 67 and retired, was 80% Deaf, as I immediately picked up when his cell phone rang. As it was the wife calling and he ran the conversation thru a Bluetooth connection in his ear, whilst I could HEAR the entire conversation. Lastly, was a 1960 23-window VW van, in a pretty shade 'O green. And as we chatted with its co-owner, we were interrupted by some man saying $110, 120? Wanting to know what she'd take for the vehicle? Standing there somewhat shell-shocked; Hey! I don't typically hang out around six-figure vehicles on a daily basis; Hya! Although I do recall this very same model fetching a then surprising $100k at a Scottsdale Barrett Jackson auction - with Mega Home builder Ron Pratt the recipient. The cheerful woman said; Oh, I don't know where my Husband's at, but he's been a VW nut all his life, and we've got a 66 Beetle which I was driving when I had the twins, but we simply needed more room after expanding to four; YIKES! It's got NOS.now and he's taken it down the drag strip a few times, to which Mary Ellen enquired; what's NOS? To which I quickly replied is laughing gas for your car, i.e. ; nitrous oxide - to which the woman, who I think said she was in her mid-forties? Concurred, explaining why the engine needed to be "built," in order to handle the extra horsepower demand. Also noting how her Hubby' hadn't been quite sure 'bout taking I-T out of its trailer that morning, as it'd threatened to rain with low hanging fog giving a mist to the air when we'd first arrived. Saying our Goodbye's, we needed to go check upon the FURR-rocious lap Hoonds' pulling Guard Duty in our "A Team" look-alike van, before we'd unsuccessfully attempt locating the 26 cars that had dropped in on their way to another Car Show in California and simply headed off to the local grocery store instead. Leaving the store, Karmically Mary Ellen spotted an English Bloke' exiting a VW Campervan and summarily chatted him up! As I finally joined the conversation as he mused how he'd sold his first 23-window bus for $400! Then his wife joined him whilst he was showing off all of the working amenities inside the van while regaling how he'd bought the bus sight-unseen, before saying they had to get going. Although I have NO idea if there's an 'Offical Popular Best of Show Award, Y'all know where simply everybody attending votes upon their favourite. Thus, as per usual, I did my own, very unscientific voting, with my Top-3 winners being, Tuh-Duh; are Yuhs really surprised?